In between pinning many wedding things to my Pinterest boards this week, I caught up on all my favorite blogs. It seems that I've been missing a lot lately. At least I have Twitter and Facebook to remind me I have fun things to read whenever I get around to it. This week's Friday Finds are some great blog posts...some are new, others are just new to me. Have a wonderful weekend, beauties! I know I will. 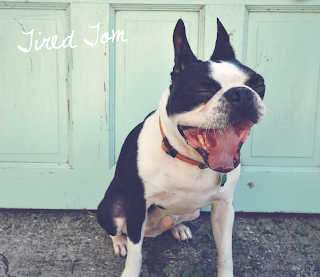 If I had a dog cute as Tom (he's the pup in the picture), I'd feature him in a pet post like Leigh-Ann from Freckled Nest did here. I really loved Joanna Goddard's post about how to talk to little girls. Sugar is sugar is sugar, no matter what fancy name you try to give to it. Wanna know how I keep my 3204958720395487 recipes organized? Here's how I keep from spending a billion dollars a month on my grocery bill.